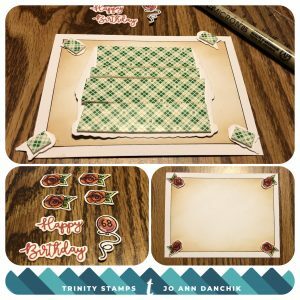 Today is my first official blog post as a Designer on the Trinity Stamp Team. I will be visiting with you here every other Wednesday, where we can creatively get through Hump Day together! So grab a beverage, I will be drinking coffee, and let’s get started. Not only is today my first post, it is also my Hubby’s birthday. We met at THE Ohio State University many years ago. We are proud Buckeyes and love to watch our beloved football team play. If you shout “OH” we will answer with a resounding “IO.” One of the highlights of the pregame show is the infamous Script Ohio, performed by the Ohio State Marching Band. We still get goosebumps as a fourth year Sousaphone player high steps across the field to dot the “i” and bow to the fans. 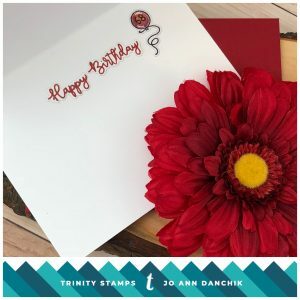 Today I wanted to share with you a different way to use the Decorate-A-Cake Stamp Set. Not only is it fabulous for birthdays, but you can also create specialty cakes to celebrate many other occasions. It can be decorated to celebrate graduations from high school or college, announce acceptance into colleges, for Super Bowl parties, Baptisms, Confirmations, and of course Weddings. The possibilities are endless! I wanted to make the side of the cake deeper so I inked only the top portion of the stamp with Ranger Black Archival Ink. I stamped onto Tim Holtz Watercolor cardstock, using my MISTI. 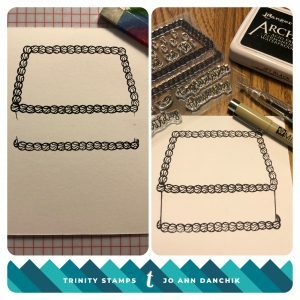 You don’t have to use a MISTI, but it makes stamping much easier on textured cardstock. After stamping the top portion of the cake I cleaned the stamp off, moved the paper up, and stamped the bottom portion. The two sections were connected using a ruler and a Pigma Micron .3 marker. Because I altered the size of the cake I had to fussy cut it. The cake was watercolored using Tim Holtz Distress Inks and #2, #4 and #6 DaVinci Cosmotop Spin brushes. I lightly penciled in the football field yardage lines and end zones. To create a background I used a piece #80 Neenah Cardstock. 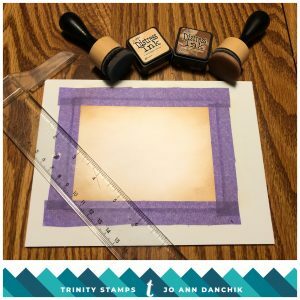 I marked and taped off a 1/4” border using a T-ruler and Purple Tape. I lightly blended Antique Linen and Vintage Photo Distress Inks around the edges for a vintage look. The Big Ten Conference playoffs were traditionally played in the Rose Bowl Game so I stamped and watercolored four roses. I also stamped the sentiment and a balloon with a 68 inside, also from the Decorate-A-Cake Stamp Set. The pieces were die cut using the coordinating Decorate-A-Cake Die Set. Scotch Foam tape was added to the back of the cake and roses for added dimension. The purple tape was carefully removed and a black line was added with a Pigma Micron .5 Marker. The sentiment and balloon were glued to the inside of the card using a Lawn Fawn tube. The yardage lines and the end zone lettering were added with a white Uni-Ball Signo Pen. I hand drew and colored an “O” for the center of the cake. I also drew and colored two footballs. The side was decorated with the infamous Script Ohio, using a black Sakura Gel Pen. To complete the card, the panel was attached to a piece of Simon Says Stamp Smoke Gray Cardstock. The panel was then attached to a folded #110 Neenah Cardstock card base using a Kokuyo Tape Runner. Thanks for joining me today. I look forward to creating with you again here at Trinity! You can also find me on Instagram at jadanchik or on my blog at jadanchik.com. 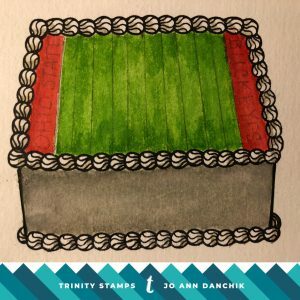 Decorate-A-Cake: One Stamp Set, Three ways with Designer Emily!